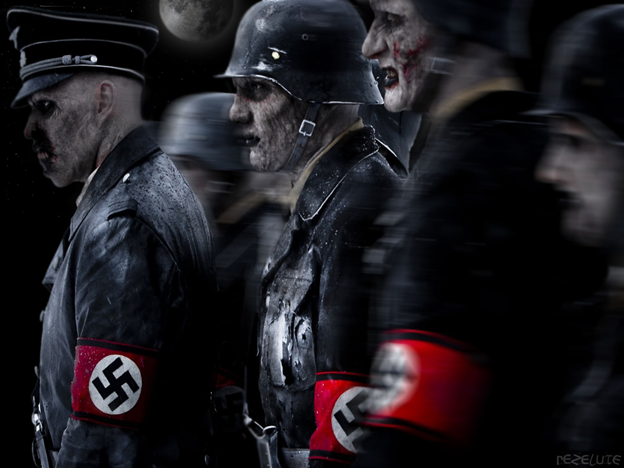 How many Zombies does it take to conquer any given empire or army? Centives decided to find out. So what is a zombie horde? Think lots of men running towards you trying to eat your brain/arms/spleen. Unarmed but if they get to you, really its game over unless you happen to be wearing a suit of armour. Most people, as far as I know, do not wear this normally. Now obviously there have been no known zombie hordes to date combated, so here’s a best estimate. Taking the infamous battle of Isandlwana, 1,800 British troops armed with rifles were defeated by 25,000 Zulu in 1879. Or, it took thirteen men with spears to take down each Brit armed with a rifle. Not bad! But what about in modern times? In terms of zombie hunting ability, the biggest change has to be the soldier’s rifle. As anyone who has read Max Brook’s World War Z knows, killing zombies is all about rounds per minute. How many times per minute can you shoot a zombie in the head accurately. That means no machine guns. Sorry guys, not accurate enough. It’s all about rifles. The Brits in 1879 used the Martini-Henry rifle, with a rate of fire 12 rounds per minute, or one round every five seconds. Max Brooks recommends a rate of fire of one round per second to stop zombies (like World War Z’s battle of Hope in New Mexico). So it takes 13 zombies to stop a Brit firing at 12 rounds a minute. So far we’ve been looking at zombies versus soldiers in a pitched battle. But what if we scale this up. Really scaled it up. What if we looked at a global scale? We’re taking the 13 zombies : 1 soldier ratio as a standard figure when the soldier can fire 12 rounds per minute. We’re then adjusting this figure to account for rates of fire of a standard infantryman in different armies. E.g. a Napoleonic Frenchman can fire 3 rounds per minute, and so can stop 7.8 zombies. Then, we’re taking that army and asking what percentage of the world’s population would have to turn to zombies to defeat that army. We’re going to call this the critical Z %. Bad time to be fighting zombies. We recommend hiding in castles. Or luring all the zombies into a castle and then locking the door. Either way. * Centives originally reported this figure to be 10.16%, an error of a factor of 1,000. We apologise to anyone who was misled and bought a crossbow. Our thanks to commentor Robert for pointing this out. If there’s an outbreak, follow him. Yeah. That’s right guys. If the Chinese army lined up in a firing line they could take out the entire population of the world in zombies over three times. Another thing you might want to account for – range of weaponry (for example, a single trained SDM with an EBR, given a rate of fire of 12 per minute, could still take down more than 66 zombies before they reached his location). Range matters greatly in this – if the zombies can’t reach you, then they can’t kill you. I’d also note that decapitation works against zombies, and despite Brooks’ dislike of medieval armour for no good reason, it would prove greatly effective against zombies. I’d rate a medieval army as sufficient against most zombie armies of similar size that they could take them down with minimal losses. Machine guns also have a definite part to play. Killing the zombies in a single shot isn’t necessary if you can cripple the zombies and prevent them from moving quickly. I would also like to see the zombie whose head isn’t obliterated by a shot from a GAU-8. Where are you getting 385,821,101 Chinese soldiers? When have they ever had an army that large? @Brad, The reason WWZ has become so popular is because of the zombie craze which has dominated pop culture for the past (30?) years since night of the living dead came out. AMCs “The Walking Dead” has also encouraged the zombie craze which helped WWZ book sales. Did you factor in the compound zombie effect? As the army grows smaller to losses each soldier must kill more zombies to keep up that percentage, and also put down the losses they’ve sustained that have turned over to the enemy! Your math is off for the crusades. The actual critical Z% is only 1/1000 of what you calculated. 32,500 zombies killed, divided by a world pop of 320 million yields 0.0001016 or 0.01%. There was no better time to be a zombie. Please, notice the comment above; it’s right. I need to disagree with your statistic for crossbows; “Weapons that made Britain” showed that it is possible to shoot up to 8 bolts/second! Of course, the problem of the crossbow is its shorter range. Too bad if it were the Chinese that were the zombies since I recall that a Chinese origin was suggested in World War Z. An interesting book from a literary standpoint but total rubbish to read. A generally dull collection of short stories on a central theme. I can’t imagine why it has become so popular except perhaps due to the decline in attention span of the reading public. At least, unlike a certain series of twinkly vampire novels, Max has an excuse for publishing atrocious english. Why Aren’t There Female Magicians? Will Sports Ever be the Same Again?